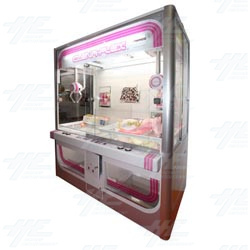 Clena-Flex is a 2 person, prize redemption crane machine from Namco which demands a higher level of skill from players. Players have two control buttons- one to move to the right and one to move back, so directionality is quite limited and the pressure is for players to get it right! Once the claw has been positioned it will lower down with it's arms open, the arms will close when it gets to the bottom, and hopefully bring back up a prize that it will drop in the drop zone. Prizes can be of varying value and size, and any combination of nine different tiles in a 3x3 grid pattern can be placed inside the machine to create a custom play field. Players have two control buttons- one to move to the right and one to move back, so directionality is quite limited and the pressure is for players to get it right! Once the claw has been positioned it will lower down with it's arms open, the arms will close when it gets to the bottom, and hopefully bring back up a prize that it will drop in the drop zone. Prizes can be of varying value and size, and any combination of nine different tiles in a 3x3 grid pattern can be placed inside the machine to create a custom play field.